(Boulder County, Colo.) -- The Board of County Commissioners today enacted a temporary, six-month moratorium (Resolution 2018-112) on processing applications for proposed development in the Niwot Rural Community District (NRCD), pending consideration of Boulder County Land Use Code amendments. After meeting with community members and staff, the Land Use Department has determined that the existing Land Use Code provisions concerning the NRCD are not adequate to provide the necessary direction in reviewing development projects in this District. Community members have raised concerns about the density and design parameters. The current regulations concerning the NRCD were written in 1993, and last updated nine years ago, prior to various changes in development patterns, community needs, and population growth. The regulations are due for review in light of the current concerns over the impacts of continuing development activities within these districts and the Niwot community. As it has been more than 25 years since the community has had a meaningful review and conversation about land use planning in this area, the Board of County Commissioners feels it is necessary for the regulations to be updated to address current development trends. The goal is to utilize and maintain the unique character of Niwot so it continues to be a healthy and vibrant community. 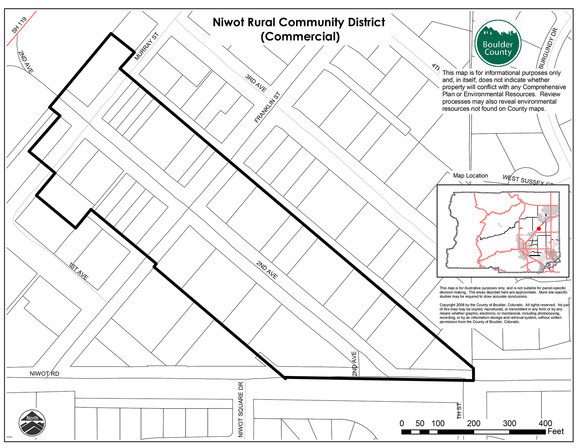 Article 4-116 of the Land Use Code was adopted in the early 1990s, as part of the process for establishing a Rural Community District (RCD) under Article 4-115, to address the unique characteristics and future development of the Niwot rural community. The regulations have undergone several, mostly minor, amendments, with the last significant update to the regulations occurring nine years ago. Staff and community stakeholders have identified several areas in need of clarification in the regulation language, including provisions regarding mixed-use development and a need to better understand and clarify the intensity of development appropriate within the NRCD. While the existing NRCD design guidelines work reasonably well in some areas of the district, the potential for inconsistent application exists in other areas. Neighbors have also raised concerns with the level of residential development allowed, density and design parameters, and whether the NRCD regulations facilitate the appropriate mix of residential, retail, and office uses. The Colorado Local Government Land Use Control Enabling Act, C.R.S. §§ 29-20-101 et seq., provides the county with the broad authority to plan for and regulate the use of land to best protect and promote the health, safety, and general welfare of the present and future inhabitants of Boulder County and to guide future growth, development, and distribution of land uses within the county. Boulder County Land Use staff has begun to analyze whether the existing NRCD regulations, and more generally the RCD regulations, are sufficient to protect and promote the public health, safety, and welfare, by appropriately balancing changes in development and growth with the present and future needs of the Niwot community. Staff anticipates the time needed to analyze necessary amendments to the regulations, as well as develop a plan to propose and adopt new regulations, is approximately six months in total. This timeframe assumes approximately two months for studies, community outreach, and staff meetings; two months for drafting, referral to interested third parties, and public review of those drafts; one month to notice and conduct Planning Commission hearings; and one month for BOCC hearings.